When I think of adventure games, we think of exploration, interaction, puzzle solving and occasional danger. Adventure games first appeared on mainframes and typically used lots of memory and caused time sharing schemes no end of annoyance. The first video game consoles were vastly inferior computing products. However, they were capable of all the features I mentioned above which define adventure games, in a much more rudimentary capacity. 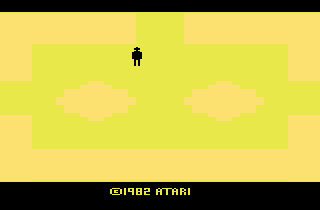 In this blog entry, I will be focusing on my characterization of adventure games released by one company, Atari, for one video game console, the Atari 2600. 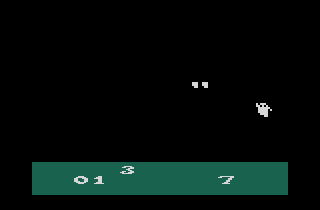 The Atari 2600 consists of three chips. The first is a 6507 CPU running at 1.19MHz. This cut-down 6502 CPU has no support for interrupts and can only address 8KB. 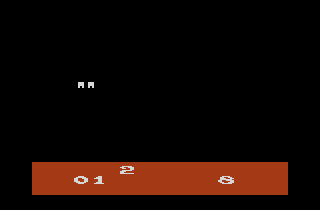 The Atari can access 4KB of ROM in a cartridge without extra hardware in the cartridge itself. The second chip is the TIA, which can generate a 160 pixel by a (typical) 192 line resolution graphics display. The TIA can only support the equivalent of five (single color) sprites and a low resolution 2-color background layer. It does support a rather large number of colors for the time, 128, and the sprites can have their colors changed every scanline or two. It also supports 2 channels of square wave sound with crude (5-bit) frequency control or various methods of producing noise. The third chip is the RIOT chip with provides a timer, 128 bytes of RAM and input for the console switches and (with the TIA) the joysticks and other peripherals. 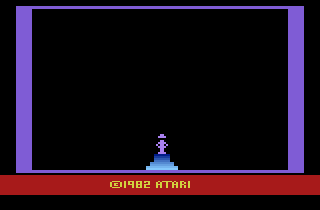 Input for the Atari 2600 was generally by a joystick with a single fire button. Alternatively, paddles or a 12-button keyboard controller could be used. 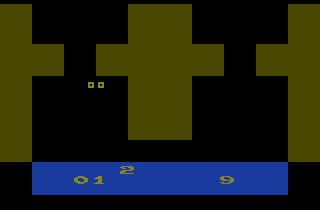 The two controller ports supported either two joysticks, two keyboard controllers or four paddle controllers. None of the games described below use anything other than a joystick. With this hardware background, let's introduce the games. 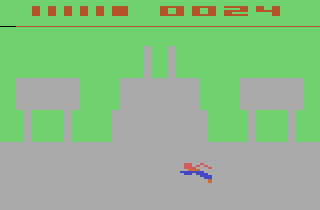 Superman is the first true adventure-style game released by Atari. It has a plot, characters, enemies and an ending. The plot is simple, Lex Luthor and his five henchmen have blown up a bridge in Metropolis and scattered the three pieces throughout the city. As Superman you must catch Lex and his henchmen and bring them to jail, find the pieces and put them back where they belong and change back into Clark Kent and go to the Daily Planet to file your story. Lex sent out some Kryptonite that will rob you of your ability to fly and to capture the villains and the bridge pieces, in order to restore your powers you need to find Lois Lane. There is a helicopter also flying around that can randomly transport people, krypton satelites and bridge pieces. Superman has the ability to view neighboring screens with his X-ray vision (push the fire button and a directional). This game solely emphasizes the aspect of collecting. In order to win, you need to collect bad guys and bridge pieces. Those rectangles and square (for Luthor) show the number of bad guys still at large. 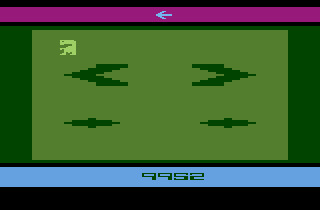 Unusually, the four digit number on the right shows the time taken, you are racing against the clock to beat the game, not trying to achieve a maximum score. Your super powers are innate to the character and can only be temporarily lost. Unfortunately, Superman has not held up very well over the passing decades. This game has three problems. First, graphics become a flickery mess the moment more than two objects are on the screen. 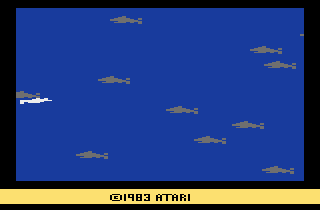 Second, most of the main screens have nondescript backgrounds, making it very difficult to navigate the game world. Third, the game world itself is not easy to get around. There is no readily discernable pattern with the subways and the city screens. There are 26 unique screens. Adventure is one of the classic games for the Atari 2600. 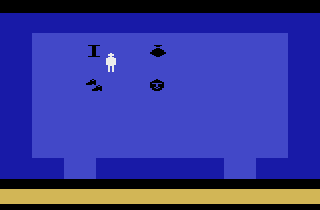 Warren Robinett decided to take a minimalist approach to the game's design. 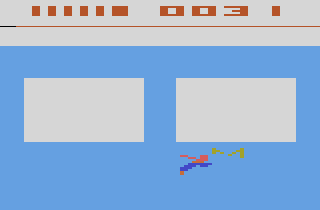 Instead of a multi-colored Superman sprite, your player was just a square. The dragons look more like ducks. Virtually every other object in the game was also a single colored sprite. Flickering does not begin unless three objects are on the screen, compared to two for Superman. Backgrounds were either empty rooms, simple castles or mazes with clean lines and good contrast between the colors. The object of the game could not be more simple, find the Golden Chalice and bring it back to the Golden Castle. 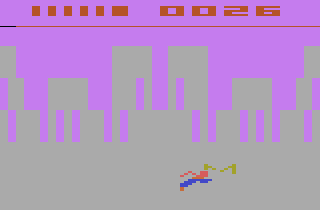 While the game's graphics would not impress anyone, the gameplay was inspired. Your square can move in eight directions, you pick up an items by touching it and the fire button drops items. However, the items your character could or needed were three keys, a sword, a magnet, a bridge and the chalice. The sword kills the dragons, each colored key open the gates to the corresponding castle. This game adds the element of puzzle solving to exploration. The three keys (White, Black and Gold) are needed to open the corresponding castle gate. The magnet and the bridge are helper items that allow you to get to places or items you otherwise could not reach. The sword kills the dragons, but since you can only carry one item at a time, you can't count on having it when the dragons come by. The enemies consist of the three dragons and the Black Bat. 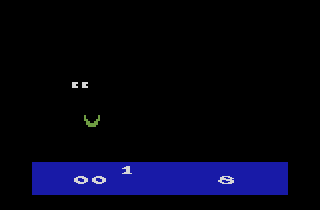 The dragons have names, different colors and distinct personalities, Robinett seemed to come to this idea independently of Pac-Man. Yorkle, the Yellow Dragon, is the slowest and runs away from the Gold Key. Grundle, the Green Dragon, is faster can be found guarding many items. Rhindle, the Red Dragon, is the fastest but typically is not seen until you get to the final maze. However, the Black Bat is by far the most terrifying enemy in the game. The Dragons will kill you but the Black Bat will constantly frustrate you by stealing and replacing objects throughout the game world. Sometimes you can grab the bat, but you can't keep him. Unfortunately, the Bat can deposit necessary items in places where you may not be able to reach. The mazes in this game may feel intimidating at first, especially when dragons are around. 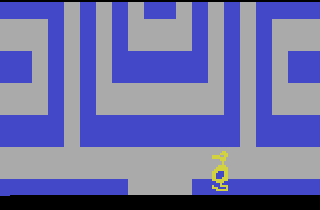 However, the exits to the maze are always predictable and soon the player can figure his way around without mapping. The maze between the Gold and White castle is called the Catacombs and only gives you limited visibility. There is also a limited visibility maze after the Black castle. Adventure brought skill settings to the fore. The game starts up with the skill level number on the screen. 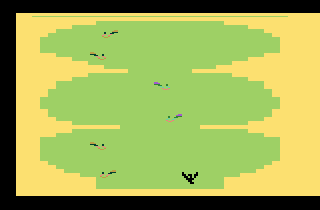 Skill level 1 is the beginner's game where only one maze and two dragons are present. Only fourteen rooms are accessible. The bat is not present. Skill levels 2 & 3 add the bat, the red dragon, more screens and three more mazes. In Skill level 2, the items and dragons are in fixed places, but in Skill level 3 they are randomized. This game was built around the number three. There are three skill levels, three castles, three keys, three dragons. The map is also an improvement over Superman. Even at 29 screens, it is easy to keep track of where you are (except in the mazes). 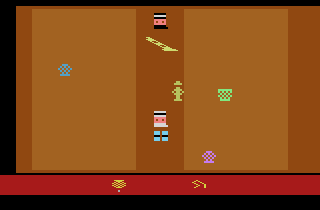 Of course, no mention of Adventure can go without the Easter Egg Warren Robinett hid in the game unbeknownst to his superiors at Atari. 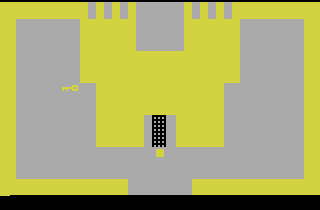 Frustrated with the total lack of public recognition and credit for his work, he inserted a graphical "Created by Warren Robinett" into the game if the player found a hidden dot in the maze after the Black Castle that allowed him to enter a room otherwise blocked by a solid line. Robinett was also responsible for BASIC Programming and Slot Racers, but this was his true claim to fame. Haunted House has been called either the first survival horror game or one of the most prominent precursors to survival horror games. Your character is essentially a pair of eyes roaming around in the dark of a four-story house looking for three pieces to an urn. Once the urn is collected, you must exit the house through the exit on the first floor. You can walk over these pieces as you explore the haunted house or press the action button to light a match for a few seconds. There are three types of enemies, the ghost, the tarantulas and the bats. Similarly to Advenutre there are helpful items, the scepter and the master key. 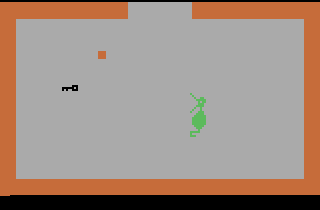 The master key unlocks doors and the scepter provides invulnerability to the enemies (except the ghost on some of the harder difficulty levels. However just like Adventure you can only hold one item or the urn at a time. The fire button also allows you to drop items like Adventure. The map is deceptively simple. The house has four floors, and each floor is arranged in a grid of 3 horizontal rooms by 2 vertical rooms. The floors are connected by multiple stairwells and the rooms by corridors. Cleverly for the 2600, each floor scrolls vertically. 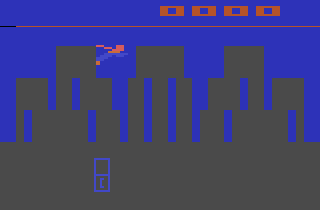 The game has nine difficulty levels. On the easiest difficulty level, you can see colored walls, but otherwise they are black and only illuminated when you are near a portion of the wall with a lit match or when lightning strikes. On the higher difficulty levels, certain rooms have locked doors requiring the master key to open each time you pass through the corridor. Also, as the difficulty levels get harder, some of the enemies can pursue you through locked doors. The locked doors are in the same place in the middle difficulty levels, on the highest difficulty level they are in different places. 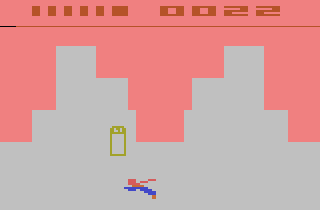 The game has a status bar, showing the number of matches used, the current floor number, the picture of the currently carried object and the number of lives you have. Fittingly, you start with nine lives. When you move, the pupils of your eyes will look in the direction you are moving. Helpfully, the manual gives you a map of the floors, doors and stairwells used for the intermediate difficulty levels. Even though the enemy designs are a bit goofy, the eerie sounds make this quite a memorable game. Up to this point, adventure games on the Atari have been pretty-much a pick up and play experience. You can easily beat them with no more information than contained in this blog. Most people can figure them out just through trial and error. Unfortunately, the same cannot be said for these later games. All the previous games were 4K games. The next five games hereafter are 8KB games. They require the manual in order to really figure out how to play or how to go about beating these games. 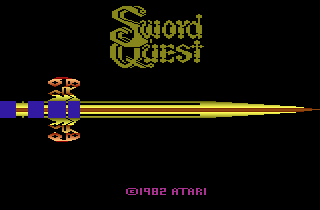 The Swordquest series was perhaps the most elaborate set of games ever released for the 2600 during its lifetime. Each game was tied to a contest and came with a comic book to give necessary hints to the puzzles and progress the official storyline. Unfortunately, the underlying games were just not that great. 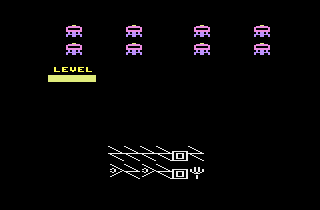 Dan Hitchens programmed ports of Berzerk, Gravitar and Mario Bros. for the 2600 and all are better games to play than this game or its sequels. 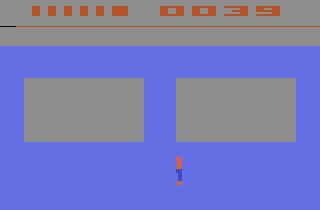 All three games have your character walk through a series of connected rooms. These rooms in Earthworld are identical in shape but have different colors. To progress through the game, your character needs to pick up items in one room and use them in another room. Putting the right item(s) in the right room will give the player a clue which he could combine with other clues to write in his entry to the contest. Sometimes using an item gives your player an action sequence to complete. These action sequences are very frustrating. There are four altogether. 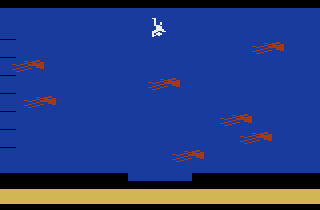 One of them, the Aquarian Rapids, is like the river portion of Frogger with all the fun taken away. Two are virtually identical and the fourth will test your sense of timing and patience. Fail at any point on any of these puzzles and you are sent back to the beginning. Earthworld has the most impressive graphics of the three games. 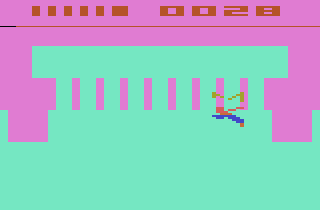 The player sprite is multicolored and the game makes good use of cycling color graphics. Fireworld and Waterworld are much more plain by comparison. The map is based on the twelve signs of the zodiac. 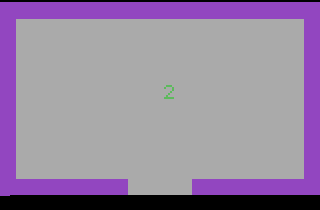 There are twelve rooms and the player can cycle through them by going up or down. The left and right exits often do not work. 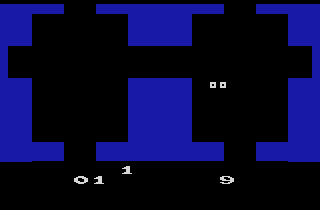 Fireworld was programmed by Tod Frye, infamous for the 2600 version of Pac-Man. Fireworld is the worst of the Swordquest games in terms of graphics, sound and gameplay. 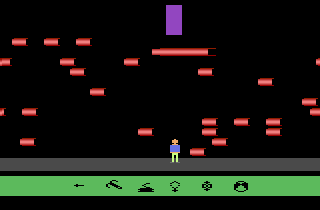 The player is single colored, the objects during the action sequences are often hard to see and there are no fancy color cycling effects. Sound is abysmal. The map consists of twelve rooms based on the Tree of Life. Unlike Earthworld or Waterworld, a room can lead to more than one or two rooms. There is not any particular reasoning behind which exit leads to which room. However, unlike Earthworld, at least each exit leads somewhere. A special item called the chalice will help you uncover more exits. The rooms have obstacles in them to make them look less generic. There are a lot more action sequences in Fireworld than either Earthworld or Waterworld. There is only three basic action sequence types, but variations on them bring the total to ten. Every time you attempt to access the items in a room, you must face a action sequence. You do not need to achieve perfection in the puzzle to access the items, just make a sufficiently decent showing. 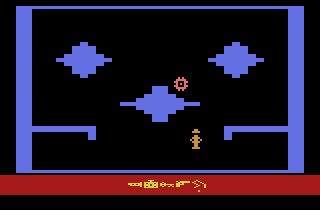 Raiders was Warshaw's second assignment after his first, Yars' Revenge became a big hit. 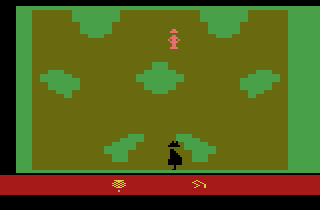 Raiders is as close to a personal computer graphical adventure game like King's Quest for the Atari 2600 as Atari ever got. There is a set path to go through the game. In every game you have to detonate the grenade against a particular wall, for example. Raiders is a complex game with many inventory items you can use. In fact, it requires two controllers to play, with the second controller allowing you to select inventory items to use. Unfortunately, handling two joysticks is very distracting and there are enemies that can kill you on most screens. Inventory items include a whip, revolver, flute, coins, Staff of Ra headpiece, Ankh, grenade, timepiece, shovel, key and parachute.You get three lives to find the Lost Ark of the Covenant, and you must face snakes, an enemy agent, tiny thieves, deadly spiders and fatal falls. 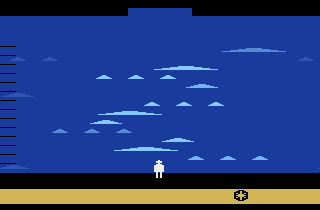 The game has thirteen areas which you must traverse, and some of the areas scroll vertically. 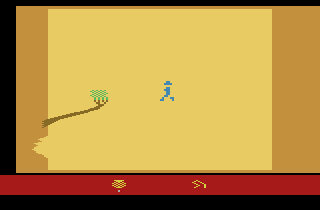 A first for Atari, you also get to interact with merchants and search for items and paths to get to your goal. 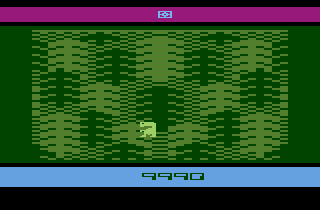 It may not have the interactivity of Dragonstomper, but Dragonstomper is a far more ambitious game. There are several places points where you have to wait a lengthy period of time in order to progress in Raiders. Raiders the movie was known for its unusual intelligence combined with white knuckle action. While this game may have something of the first, it has nothing of the last. 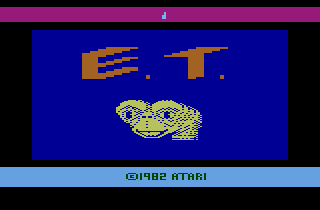 Warshaw's final published game for Atari is the legendary E.T. the Extra-terrestrial. People have endlessly criticized this game for its obtuse goals and mechanics, buggy pit falling mechanics and even the color of your character. 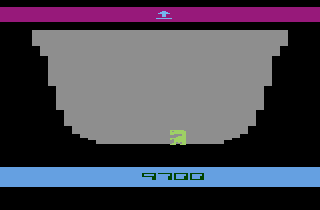 Of course, if you read the manual you can actually have some fun with this game, it is far, far from the worst game on the Atari. The goal of the game is to find the three pieces to a phone so E.T. can phone home for a transport. These pieces are randomly hidden in the 20 pits in the game. The game world is simple, you have only six screens. 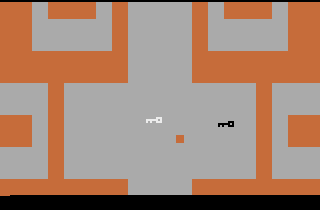 The game's map is in the shape of a cube, with the landing zone on the top, the four pit areas on the sides and the Washington D.C. screen on the bottom. There are two notorious pit bugs. The first is when you just climb out of a pit and see the map screen, never push up. You can push left, right or down to totally clear the pit, but if you press up you will be sent back into the pit. Every pixel of E.T. must clear every pixel of the pit. The second pit bug is that exiting right from the landing zone or left from Washington D.C. will always send you to the bottom of a pit. Except for the easy game, standing in the way of E.T. are two foes. The first is the scientist, who capture E.T. if he touches E.T. and bring him straight to his lab in Washington D.C. for study. The scientist is merely a hinderance. The F.B.I. agent is much, much more annoying. If he touches you, he will take a piece of your phone away. The F.B.I. agent is akin to the Bat from Adventure and the inspiration is obvious. Unlike the three lives of Raiders, E.T. has a health meter that starts at 9,999 units and runs down to zero. The health meter runs down if you are walking, and runs down faster if you are running or using a special power. If your health meter runs to zero, Eliott will come and revive you three or four times with 1,500 health. You can also restore health by eating the Reese's Pieces found on the pit screens. Otherwise, you can save them for points at the end of the game. E.T. can use special powers, but only at various areas of each map screen. If you walk into a power zone, you can teleport to another screen, call your ship, call for Eliott to give him Reese's Pieces for points at the end of the game, eat a Reese's Piece for energy or see whether any of the pits on that screen has an item in it. In a pit, you can extend your neck to levitate. In the landing zone, you have to find the area on that screen where the transport capsule will land, otherwise you won't get picked up and will have to call the ship again. So, beating E.T. is far simpler than Raiders or any of the Swordquest games. You find the three phone pieces, find the area on one of the pit screens to call your ship and find the area on landing zone screen where your capsule will pick you up. 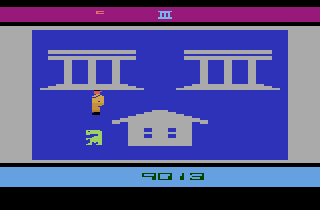 This is another game that revolves around the number three, there are three phone pieces, three types of screens, three structures on the Washington D.C. screen, three characters in the game other than the player, three (usually) chances to continue, and three principal tasks to accomplish. In the last Swordquest game to be released, things have been toned down quite a bit from Earthworld and Fireworld. 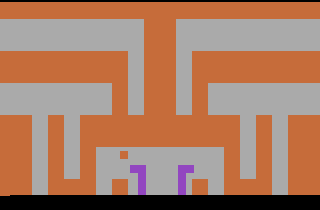 In this game there are only seven room based on the Chakra, and unlike Earthworld the last room does not wrap around to the first. The action sequences are much less annoying this time, and you encounter them not by using items but by entering rooms. They are still of the "touch an enemy, miss a jump, return to the start", but are much easier than Earthworld or Fireworld's action puzzles. 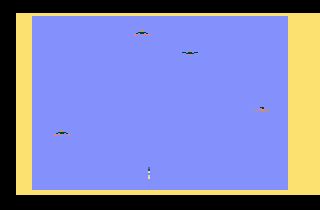 Only the Ice Floes action sequence is annoying, just like its Earthworld counterpart Aquarian Rapids. If you cannot finish a puzzle after a set period of time, the game will let you progress into the next room anyway but one of the items in that room will be unavailable. Waterworld may not be as flashy as Earthworld, but its does have some color cycling. The sound effects and musical cues are undoubtedly the best of the series, but there is not a great deal of variety to the sounds. 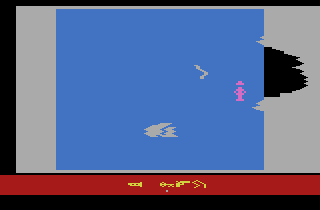 Frye had definitely improved his presentation skills this time around and was working on Airworld, the final game in the series, before Atari shut the whole project down. 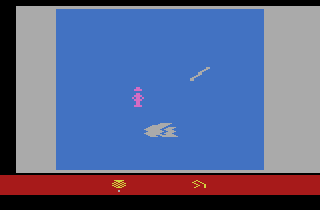 There were contest winners for Earthworld and Fireworld, but the Waterworld contest was never held due to Atari Inc.'s implosing from the Video Game Crash of 1983. 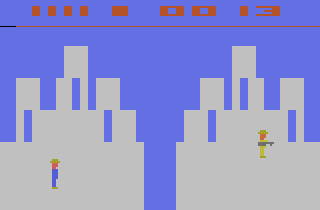 During the Atari 2600 revival of the late 1980s, the Tramiel-led Atari Corp. looked for companies who were willing to develop for their console. One such company was called Axlon, headed by Nolan Bushnell and it programmer Steve DeFrisco made three of the best quality games released late in the Atari's lifecycle, this game, Motorodeo and Klax. 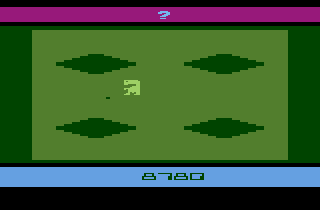 This is among the most ambitious of Atari 2600 games, using 16KB for ROM and containing an additional 128 bytes of RAM in the cartridge. 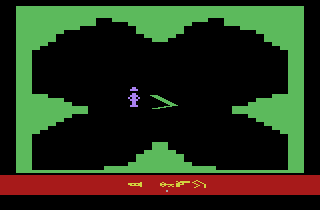 Secret Quest uses a top down view, but the character's sprite has different graphics for moving in each direction, unlike Adventure and Haunted House. 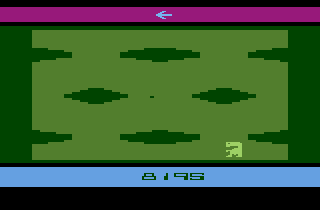 In this sense, it plays like an Atari 2600 version of The Legend of Zelda would play. 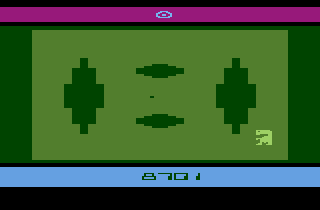 The object of this game is to blow up eight space stations. Each station has multiple rooms and most have multiple floors. One or more codes will be scattered throughout the floors in particular rooms. There is a room where you enter the code to destroy the station. Once you enter the code you have 20 seconds to get to the teleporter or you will go down with the station. Secret Quest has sparse rooms but colorful sprites. Note that no more than one enemy is on the screen at any time, this helps reduce flicker to a minimum. A new enemy gets teleported into the room as you beat an old enemy until you clear the room. Enemies do not respawn in a room once it is cleared. There is a constant background tune that lasts for 18 seconds that plays constantly once you start a game. Sound effects are pretty basic. 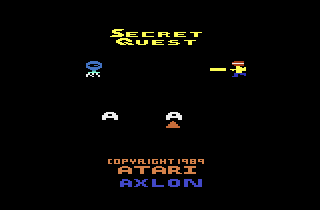 Secret Quest is almost unique because it is only one of two Atari games that has a password system. Survival Run had a twelve character code, and it sensibly used numbers 0-9. Secret Quest's passwords also use a twelve-character code, but overdid it. Instead of using letters and numbers like most other games, Secret Quest's passwords consist entirely of "futuristic" symbols. They are not the easiest to jot down quickly as one wants to end his game. These symbols are also used for the self-destruct codes in the game. You also need to remember the initials you entered when you started the game, as they are tied to the passwords generated. The password will allow you to start not just at the level where you received it, but it will also recall the Energy and Oxygen you had, the items you picked up and your score. Secret Quest is rather different from any of the above games. 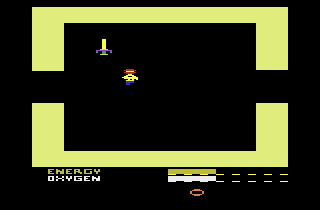 The game is much more focused on combat. You can pick up three weapons during the game, with the later weapons being more powerful and consuming more energy than the first. There are no puzzle items except sonic keys, which open a door. 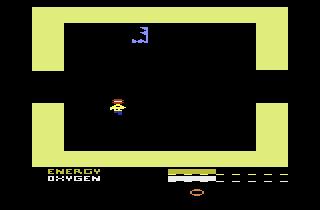 When you clear a room of enemies, they will drop an Oxygen Bottle or an Energy Pod. 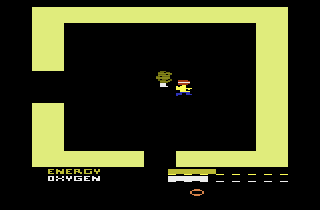 Oxygen functions as your life bar and the Energy bar allows you to use weapons. It will be a constant struggle to keep these meters above the empty mark. The Oxygen bar will be depleted if an enemy hits you and also decreases as you explore. 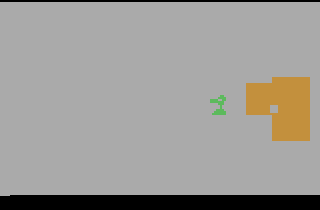 In this sense, Secret Quest is similar to Gauntlet. There is no real puzzle solving in this game. However, it qualifies as an adventure game because there is exploration and collection like in E.T., Superman and Haunted House. It is the need to scour the space stations for the codes, the self-destruct room and the teleporter that separate this from a pure top-down action game like Dark Chambers.